Heat the refried beans (either on the stove or in the microwave). At the same time, cook the egg. Arrange the refried beans on a plate and place the egg partially on them. Arrange slices of avocado around and top with salsa. Sprinkle with cheese and serve. Give me a runny egg, some refried beans and avocado and I am a happy lady. And that egg? The runnier, the better. When I do brunch, one of my very favorite things to order is huevos rancheros. Are you familiar with it? 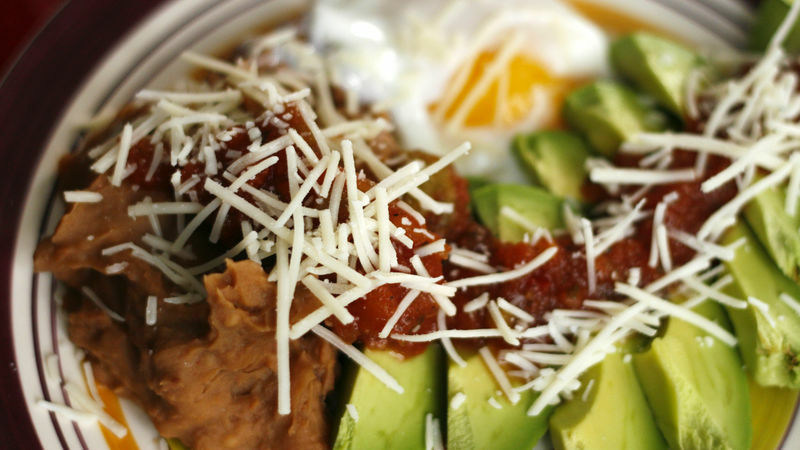 It’s a fabulous Mexican egg dish – a corn tortilla topped with beans (usually refried beans), avocado (or guac), cheese, salsa and a fried egg or two. It’s filling, flavorful and just amazing. The thing is that as much as I love this dish, I have always felt woefully intimidated about making it at home. Yes, it’s a simple dish, but at the same time, it’s not. Those beans in particular give me pause. But I discovered something: Using canned, fat free Old El Paso Refried Beans totally works. Somehow, I had it in my head that I really needed to do the beans portion from scratch -- but I don’t. And my Quickie Huevos Rancheros Plate is my new favorite at-home breakfast. Of course, I have taken some liberties here. For instance, I eliminate the tortilla, which isn’t a big part of the dish for me. I am perfectly content not to have it, but if you really want it, simply pile everything onto that instead of a plate. Oh, and one more thing. For the salsa? Hotter is better. The burn of the salsa is a fabulous pairing with the cool, smooth avocado, runny egg and mass of beans. Just sayin’.